Two of types of hair restoration procedures on Long Island that are highly popular today include follicular unit extraction (FUE) and follicular unit transplantation (FUT). 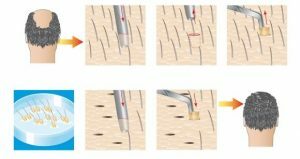 Both methods involve the relocation of follicular units or hair “roots” that can produce anywhere from 1 to 3 hairs. The two procedures, however, differ in how they are performed, as well as in aspects of the patient’s recovery. At RHRLI, we perform FUE procedures using the most advanced robotic technology available called the ARTAS® System. By using this state-of-the-art system at RHRLI, it allows for precision so advanced that it eliminates the need for any manual handheld devices. Additionally, it makes the whole FUE hair restoration procedure virtually-painless. With this system, we are able to use advanced digital imaging and algorithms to identify which hairs are most suitable for harvesting. We are also able to rely on this modern technology for both the harvesting and transplantation process, allowing for a much higher level of accuracy and speed in comparison to manual methods. Most patients who had a previous “strip” or FUT hair restoration procedure usually do not have a second procedure because of the pain they experienced, sleepless nights encountered, and recovery time involved. We are finding that those patients are now electing to have a second hair restoration procedure with the ARTAS® Robot to either increase their density or to address another area. They can’t believe how easy and nearly painless it is and wished this technology were available to them sooner. Their downtime is much shorter, and they have no problems sleeping at night as they experienced with the strip procedure. If you are interested in undergoing a hair restoration procedure or would like to learn more about the difference between FUE and FUT procedures, call us at (516) 605-1545 or fill out the contact form and someone will get back to you.